Ramboll. Dalston Works. Image: Daniel Shearing. Ramboll is the UK’s leading CLT (cross laminated timber) designer with extensive experience in concept design, detailed design and connections design. We have worked with CLT for over 15 years and designed some of the biggest and tallest CLT buildings in the country. Originally CLT was associated with in-situ construction techniques, which are reliant on on-site operations and conditions, but in more recent years, the industry has progressed to a hybrid state of using both in-situ techniques with some pre-fabrication. Our specialist CLT engineers have been pioneering the latest CLT techniques of pure pre-fabrication in controlled factory conditions, with organisations including Legal and General and Swan Housing Association. Swan Housing Association is committed to using CLT to form the structure of the modules, which are formed and fully fitted out in factory conditions. They are then transported to site on the back of a lorry. Ramboll is currently in partnership with Swan delivering three CLT modular residential projects across Essex and Greater London. Over the past few years Ramboll has been a driving force in improving the productivity of our industry. We have invested in digital design tools and combined them with our expertise in offsite construction. One of our latest innovations is our ‘Offsite Review’ tool that demonstrates the savings brought by various modern offsite construction techniques, with insight gained by going through planning cycles multiple times with different systems. Suitable for company and/or project reviews you can gain useful insights into harnessing more value from offsite construction. Having worked on over 50 timber buildings, across a range of sectors, we have been able to bring this insight to our digital toolkit. This and our constant ambition to push the boundaries of CLT capabilities has resulted in numerous industry awards, including RIBA, RICS, IStructE, ICE, Offsite Awards and the Structural Timber ‘Pioneer Award’ for our contribution and expertise in CLT over the past 15 years. Through the volume of timber projects Ramboll has completed, we have demonstrated that timber is a viable option for many types of buildings and boasts many benefits including; shorter construction programmes on site due to offsite prefabrication. The safety of site conditions is also vastly improved with fewer on-site construction workers and production undertaken in controlled factory conditions. Once occupied, CLT modules exhibit impressive energy efficiency due to the airtightness of the structure ensured in factory conditions. It delivers lighter buildings, requiring smaller foundations, resulting in further sustainability and cost benefits. Meanwhile, the environmental benefits of CLT have long since been heralded: its sequestration of carbon results in approximately half of the CO2 emissions of an equivalent concrete structure when considering the full life cycle of the material. Furthermore, when large areas of a CLT structure is left exposed, it can create a striking architectural feature, which not only adds a great aesthetic value to the building but can also yield many savings in interior wet trades as the large timber panels eliminate the need for a significant quantity of interior blockwork partitioning and plastering. We have challenged preconceptions about fire, longevity, mortgages, insurance, availability and many other client concerns and CLT is growing in popularity as a material of choice. 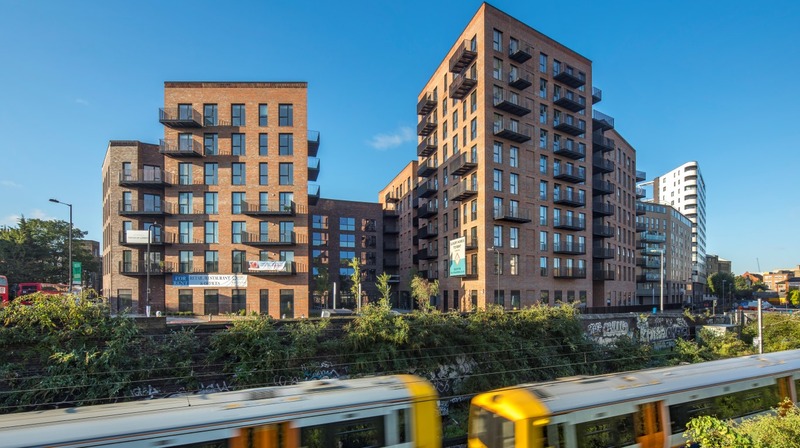 As well as growing in popularity, the scale of cross laminated timber buildings also continues to grow as demonstrated by Dalston Works, a 121 unit residential development in Hackney. More than 3,500m3 of timber has been used in this development, making it by volume, the largest CLT project globally and the tallest building of its kind. Our continued innovations in CLT have undoubtedly led to its increasing versatility and viability across scheme types. It has resulted in a vast number of successful projects and award-winning projects. We are constantly striving to improve our knowledge of timber and broaden its applications, pushing the limits of this highly sustainable material. To this end, Ramboll has been working with the University of Bath, Cambridge and Imperial College London, actively seeking out and supporting areas of timber research – such as polymerisation of timber and timber-concrete composites. Exploration into the use of larger format materials with fewer connections and hence fewer opportunities for error, such as prefabricated CLT panels, could be the next step towards holistic pre-manufactured design. The results of much of this work have fed directly back into our designs and into the wider timber industry. We are also keen to work with industry to ensure that the latest developments in both design and products are understood and to discuss new ideas. To facilitate this, we have built relationships with several product suppliers, written case studies for various publications and books, are members of the cross-industry Timber Research Focus Group, been involved with the peer group reviewing of the proposed National Structural Timber Specification and participate in the timber BSI committee. The 20,000 tonnes of CO2 sequestered through our timber designs over the past 15 years is a testament to Ramboll’s commitment to minimising the environmental impact of our developments and to enhancing the liveability of our towns and cities using sustainable materials and advanced technology. By extolling the virtues of timber, in particular CLT, these materials are now viewed as a viable alternative to traditional construction materials.